Irish studio NOJI Architects built this angular extension to a heritage-protected Dublin house with reclaimed bricks to create a seamless transition between old and new. 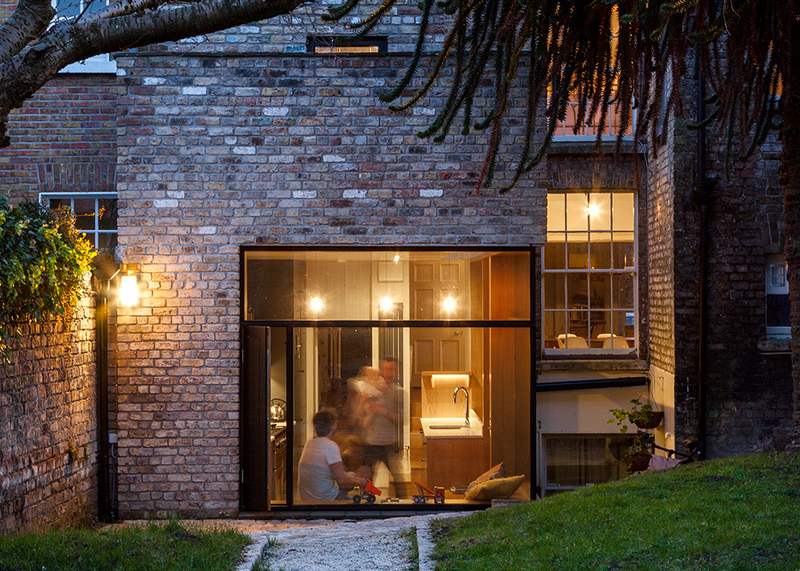 NOJI Architects designed Brick Addition to provide more space and a better connection to the garden for a three-storey house in Dublin's Mount Pleasant Square, which is described as one of the city's most beautiful Georgian squares. The property is the last remaining house on the square with a full garden and its original detached mews house intact, but it previously suffered from a disconnected route between these elements and the house. The kitchen was also poorly located in the basement, where the ceiling height is just 2.2 metres. The two-storey extension provides the owners with a new kitchen at the rear, which opens directly onto the garden, and a new bathroom above it. To build the 14.4-square-metre extension, the architects had to navigate between the challenges of maximising space, maintaining the flow of light to neighbouring properties, and satisfying the strict guidelines of the Dublin City Council. This was achieved in part by creating two tapered volumes, designed to avoid overshadowing neighbouring houses and the rooms of the existing house. The roof of the lower volume on the ground floor is taller at the back, providing extra height for a seating area that overlooks the garden. It slopes down as it approaches the house, in order to avoid blocking light to the rooms behind it. The roof of the upper volume slopes in the opposite direction, following on from the existing home's roof pitch. Reclaimed bricks were also used to smooth the transition between the house and extension, while reclaimed concrete was chosen for the window sills. "The form was massed to give the impression of maximum weight to the two volumes," said the architects, whose other projects include an extension that uses plywood for its structure, as well as its interior surfaces. "The massing allows the new extension to sit alongside the original house comfortably, while also opening up to the garden. The use of reclaimed bricks and reclaimed concrete sills gives the new extension a sense of permanence," they added. A slot-shaped skylight runs along the edge of the new kitchen, which faces north, to bring more light into the room. A bench with integrated storage was added at the end to provide an informal seating area and a closer connection with the garden. Concrete flooring was used to complement the colour of the dark-painted wooden cabinets in the kitchen, and window frames and walls were finished in lighter-coloured, unpainted timbers. A timber staircase connects the kitchen with the living space half a level higher, providing a discreet connection between the old and new sections of the house. "The plan and use of the ground floor has been radically changed with a new sense of connection with the garden and mews house beyond," added the architects. "The extension sits with a sense of harmony, binding with the existing house, and complements the terrace with a brick addition that is also of its time." Brick is often used for extensions to create a seamless relationship between new and old. Other examples include a two-storey London addition with bricks that match those of neighbouring houses, and an extension with a corner of glazing that retracts fully into its brick walls.